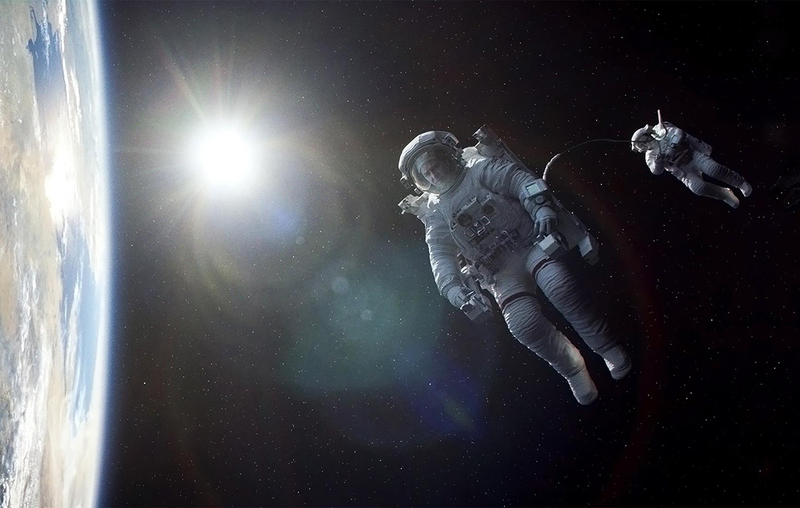 In the recent film release, “Gravity,” astronauts are left stranded at the Hubble Space Telescope (HST) after a pretty horrific accident. Since one of the astronauts was wearing a Manned Maneuvering Unit (MMU), they used the nifty apparatus to get to the International Space Station (ISS). We like this movie, even though many space blogs have been written about how this feat is virtually impossible, simply because of the different orbital heights and orbital inclinations. So the question is whether there is a way to find out if the accusation is true? I mean it’s not like there’s a Pre-Calculus class out there in America that is actually running a S.T.E.M. project that calculates Delta V, is there? Well, guess what? There really is. As it turns out, The Learning Community Charter School (TLCCS), a High School in Albuquerque, NM, has a Pre-Calculus class that is running a S.T.E.M. for the Classroom Delta V project. They even have an app for it! Moreover, they presented their findings to their class on October 17, 2013. 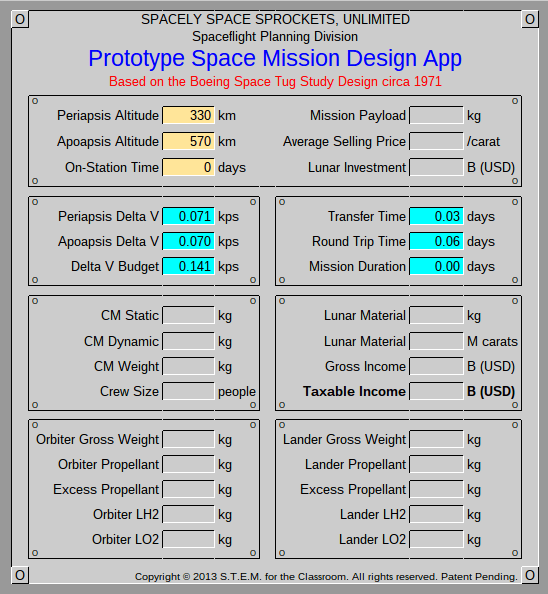 Now the question is can we use their app to determine the required Delta V that our hapless astronauts need? Sure we can! Let’s plug in some numbers and find out how. Note: For this exercise, we will ignore the orbital inclination and destination positioning. Uh…don’t ask. 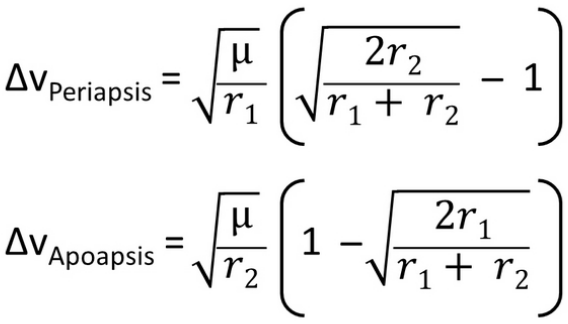 The equations needed are a bit sticky, but they work nicely, especially in a spreadsheet. Here’s some technical terms to match what the students had to work with: the periapsis is the lowest point of an elliptical orbit, while the apoapsis is the highest point. Since the astronauts start at the higher orbital altitude, and try to thwart their momentum instead of applying an opposite thrust, we’ll only concentrate on the Apoapsis Delta V.
First things first: if you what to change your orbital altitude, you must know the orbital altitudes that you want to change from and to. Looking up the particulars of HST and the ISS, we get that the HST Orbital altitude is 354 miles and the ISS Orbital Altitude is 205 miles (your mileage may vary, since their orbits are decaying). Of course, we have to always first convert everything to S.I. units for the app. Therefore, since one mile equals 1.609 km, The HST orbital altitude is at 570 km and the ISS orbital altitude is 330 km. We’re now set to tackle the question. To the Batmobile app! The link above is to a working copy of the Delta V App that S.T.E.M. for the Classroom has created for TLCCS students to use in their Pre-Calculus projects. The inputs are: Periapsis: 330 and Apoapsis: 570 (we can ignore the On-Station Time). The output is: Apoapsis Delta V is 0.070 kps, or 70 mps. Not much of a change needed, huh? But can the MMU handle it? The MMU is rated at 24.4 mps. Since 24.4 is no where near 70, we therefore can safely conclude that the MMU does not have the capability of reaching the ISS from the Hubble. Too bad this kind of stuff isn’t taught at a High School somewhere, huh? Oh wait. There is a High School out there somewhere that is trying their best to provide students with relevant math topics after all. This entire lesson was taught at TLCCS, and will continue to be taught, along with other innovative and fun S.T.E.M. stuff geared for Pre-Algebra, Algebra 1 and Algebra 2 classes. Besides, wouldn’t this lesson be better than wasting time on Standardized Tests? Isn’t this a better way of getting students to a deeper level of understanding in mathematics and critical thinking? By the way, the movie has great human drama and has got some great special effects. However, what’s projected on the screen simply ain’t happening. Our students proved as much given all the above. Previous Article How long before we get there?